Everyone knows that keeping track of daily tasks has become a lot easier ever since we have a calendar on every device we own. Our personal computers, tablets, and smartphones have become focal points in time management. But even with all this technological advance, being able to print out your entire schedule will always be the most reliable option. When you lead a busy life, being able to oversee yourself is a true skill that only the most successful people learn. This is why it’s significant to have something that eases organizing tasks, appointments and more. A printable calendar is thus a must-have in this situation. Here are five steps to help you master your time using it. Depending on what your daily activities are, certain templates might fit better than others. Fortunately, there are plenty of calendar printout formats to choose from, and each one of them caters to a specific set of management needs. Do you prefer to jot down an appointment in its entirety, or split it into several 10-minute intervals? Are you a big fan of straightforward, primary school-like timetables, or do you prefer something a bit more complex? No matter what your preferences are, choosing the right format will make or break your success. It’s crucial to find something you can vibe with completely because it will keep you motivated and focused. When putting your calendar together, account for every single minute is essential for creating a successful routine. According to Entrepreneur.com, different types of meetings, appointments, business calls and whatever else require tailored time slots. Therefore, you need to set up a system beforehand. Office and staff meetings are perfect for a 30-minute window, while those that occur outside the company, such as business lunches, should be upped to 45 minutes. This allows you 15 minutes for the commute, which should ideally be a short one. Calls are best placed at the 10-minute mark, but depending on the importance of the topic, you can go up to 20. When the appointment is set by someone else, you need to adjust the dedicated slot to their approach. Nevertheless, this is perfectly possible if you take the time to administer everything in advance. Last minute changes will always wiggle their way into your schedule, but it’s important to have the essentials written down. 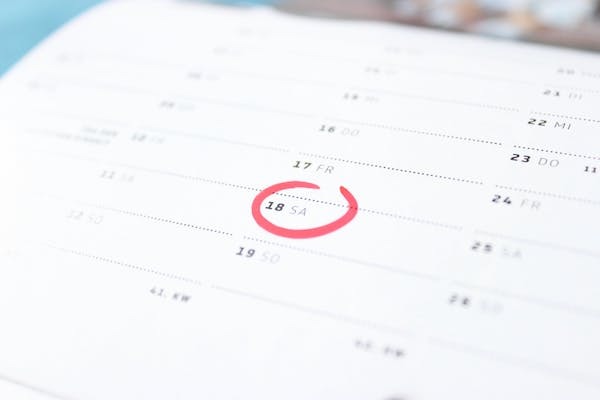 Employers and employees alike can benefit greatly from managing time using a detailed calendar. It’s a great way to prioritize task efficiently among yourselves, giving everyone the fair opportunity to delegate responsibilities efficiently. In this way, no obligation will be left unmet out of lack of a centralized system. And while workers will know exactly what they need to do and when to do it, their superiors can also oversee the rate at which things are accomplished. Because printout calendars are also exportable, corporate communication becomes more effective than ever. And even when you work on your own, having your priorities straight is great for productivity. Putting your leisure activities in a calendar with strictly allotted time intervals might seem like a killjoy at first, but it can be a great reminder to unwind every once in a while. A lot of successful businessmen and women find it hard to take time out of their day to go out, exercise or spend time with the family. Due to this, organizing time in such a way so that they become possible and even almost mandatory is an excellent bonus. Being a workaholic is all fun and games, but no one wants to come home to an upset significant other in the evenings. Think of the important things in life, and always make time for them. Even when you have everything planned down to the specifics, unexpected situations might arise. It’s vital to account for them in your calendar as often as possible so that the entire thing isn’t thrown off track by a simple change. If that happens, readjusting will be hard. But what is the most hassle-free way to manage such a situation? The answer is rather simple. All you have to do is leave some free slots in your schedule so that you have the liberty to move things around when something comes up. This is impossible when your calendar is booked solid, so avoid approaching the situation in this way unless absolutely necessary. When setting up your calendar, the first step would be finding the right template to suit your needs. Then, it’s time to split your time into slots that aid with efficient task prioritization. Your free time is also something to account for, and don’t forget that unexpected issues will always arise. But by respecting these five steps, you’ll be on the right track in no time at all.